The colored bouquet wrapping paper and ribbon can be used again later. The green fillers in this rose bouquet depend on their local availability in the flower market. One rose hip comprises of as many as 40 to 50 seeds. 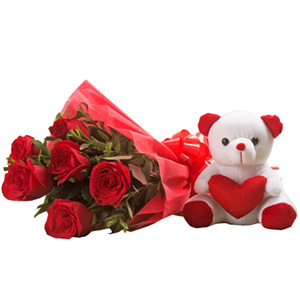 This beautiful and attractive flower bunch with a cute teddy bear is sure to make your dear one feel too loved and blessed to have you in his/her life. 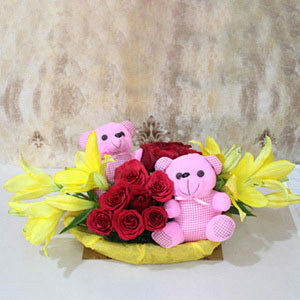 The lovely flowers bunch will help you express your heartfelt emotions and the cute teddy will make him/her feel loved like never before. This is a very pretty and cute hamper. 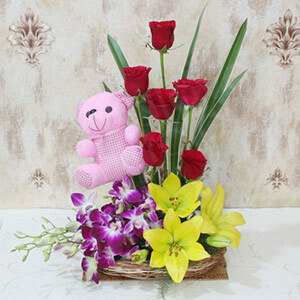 The teddy, flowers and chocolates, all were received in good condition. I am extremely happy with the product. This is a very cute hamper to gift during the valentines week so I gifted it to my girlfriend. Thanks giftalove.